In the process of creating your brand, or any marketing campaign for your brand, one of the most important parts is going to be the color scheme you choose. Whether you’re rebranding, or newly establishing your brand, color is the most important detail to put some research and thought into. Not only is there a lot of psychology that goes into the way people will perceive your brand based on one glance, but your brand’s color scheme will subconsciously trigger different feelings in every customer you reach. So, how do you make sure you get it right? To choose the right colors for your marketing and branding content, it’s vital to know how color affects branding and marketing. Before we get into how that works, let’s look at the difference between branding and marketing, and how they work in tandem to grow your customer base. When you look at any of the brand logos above at a glance, we bet there’s a good chance you recognize most of the them, if not all. This is because each of these has strong branding, which carries into recognizable marketing that we as consumers are able to recall at the drop of a hat. This exemplifies how branding and marketing go hand-in-hand, but let’s look at what exactly sets the two apart. Branding is your strategy to connect with your target demo–taking their interests and needs into consideration, and shaping the way they view your brand. It involves coming up with strategic ways to communicate solutions to your consumers through everything your brand says, does, and produces. The best way to brand is to keep it authentic. Doing your research and having a true understanding of your customer base and how your product or service can help them is key to being able to communicate that message through marketing. Marketing is your method of spreading your brand’s message. It is the process of reaching and engaging with your target demographic, once you’ve established who you want to reach and how you want to talk to them. Distributing your brand and getting your target demo to take action is the ultimate marketing goal. Color is ultimately the defining feature of your brand. In a study conducted by the Seoul International Color Expo, 92.6% of the consumer respondents said that visual factors are the most important when they are purchasing a product. To most of us, this is no surprise. We already know that consumers make judgements about people, places, and products within just seconds of their initial viewing. This absolutely goes the same for brands and their products. The study discussed above also found that ads printed or displayed in color are read up to 42% more frequently than the exact same ad displayed in black and white. This is simply because color catches your eye more. This useful fact puts further emphasis on the importance of choosing the right colors for your brand. While there are certain colors that are more popular in branding, when it comes to choosing your color scheme, it should go in tandem with the brand image you’re trying to portray. This will be an integral part of your branding process. Based on what you “know” about your consumers, assuming you’ve done your research and have chosen a solid target demographic, decide what sentiment your brand needs to convey to them. What colors do you think they would most like to associate with whatever your brand offers? It can sound complicated, but it’s usually pretty intuitive–it just requires that you do put some thought and consideration into it. Psychologically, certain colors are known to evoke certain feelings. 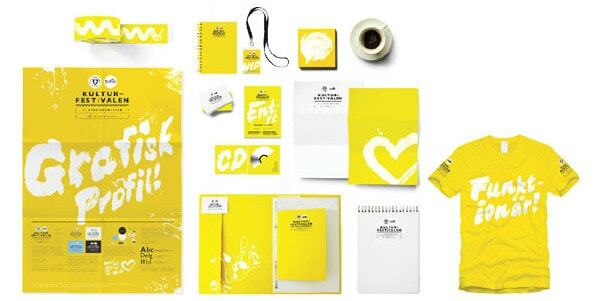 For example, in marketing, the color yellow is often used to convey optimism, while blue is often used to convey tranquility, trust, and reliability. The way you pair your colors, however, will have a huge effect on the message you convey. A monochromatic color scheme will give your brand a sleek and clean look, while a complementary color palette will give your brand a bold and impactful appearance. While these color associations can be true in many cases, the way your branding is perceived will also be strongly affected by other aspects. 1. Individual experience Each individual’s reaction to any give color is somewhat dependent on their own personal experiences. When deciding on your color palette, think about your target demographic. Based on what you know about them, are there any colors that you think would trigger a specific positive or negative association? In the process of choosing your colors, think about your audience. You have to know their interests, needs, priorities, and who they are both as a consumer and a person. 2. The context Look at where you’re placing your brand’s marketing content. Will the colors blend in, or will they stand out and catch attention. Another part of this is that color perception can be situational, known as the Von Restorff effect. For example, when speaking about a call to action on a webpage, it is more likely to get clicked if the color of the button is a strikingly different color than used on the rest of the page. 3. Cultural associations While this factor a slightly less prevalent than the others, it can be very important in some situations. For example, pairing red and green will automatically trigger most brains to think about Christmas, just like using orange and black will make many people think of Halloween. Certain cultural associations are strong enough to overpower even the strongest branding. Overall, color plays a vital integral role in marketing and branding. It is one of the first things that will influence your customers’ first impression of your brand, and one of the first ways they will start forming their judgements of your products and services. Using just a bit of background knowledge to create your brand’s color palette will help ensure that your colors convey the message and feeling that you want to get across to your target audience.